Mordicai Gerstein is the author and illustrator of some 30 books for children, including the 2004 Caldecott Medal winner, The Man Who Walked Between the Towers. 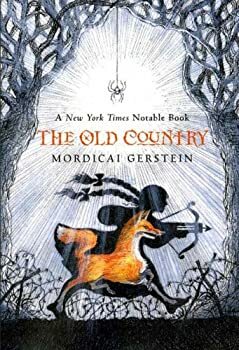 A four-time winner of the New York Times Best Illustrated Book of the Year Award, his books include fantasy, Biblical retellings, biography, folklore, and alphabets and other works for preschoolers. Here’s Mordicai Gerstein’s website. Gisella lives in the Old Country, where “every winter lasts one hundred years, and every spring is a miracle.” In one tumultuous day, her brother Tavido is drafted into the army on the eve of war, even though they are Crags, a despised ethnic group. When she goes into the forest to hunt the fox that has been stealing her family’s chickens, she makes the mistake of looking into the eyes of the fox, and finds herself in the body of the fox, and the fox in control of her own body. When she makes it back to her farm, she finds that the war has come to her farm, and everyone is missing. Accompanied by the family cat, a chicken named April, and the sprite Quick, Gisella sets off on a cross-country adventure to find her brother, her family, and her own body. Tales of Pan — (1986) Ages 9-12. Publisher: A collection of tales about the Greek god Pan and his relatives and some of the grand and silly things they did. The Mountains of Tibet — (1987) Ages 9-12. Publisher: A tenderly told story about an old woodcutter and his choices when he faces the chance to live life over again. The Giant — (1995) Ages 9-12. Publisher: Three lively little girls attempt to start a friendship with a lonely giant. FIND MANY MORE CHILDREN’S BOOKS BY MORDICAI GERSTEIN.